It has to be ridiculously difficult to do to a project like Batman Eternal. 52 issues weekly, with a massive creative team and several major plot threads that had to all be tied together in a neat little bow. Not to mention because of the structure of the story, many Batman stories that came out during Batman Eternal ended up being set AFTER Batman Eternal. So, I have to give the editorial team a huge round of applause for the work they did here. Batman Eternal truly is a masterpiece, one of the best Batman epics I've ever read. I had all but given up on Batman over the last few years, but between Batman Eternal, Tomasi's work on Batman and Robin, and Snyder's run on Batman, I have found myself enjoying the Batfamily more than I have in a long time. I do have a lot of positive to say about this book, but I did want to get the one negative comment out of the way first, because it's kind of important. This book probably should have been closer to 40 issues. It felt like there were large chunks of it that were heavily padded just to get us to DC's magic number of 52. I read the first half of this basically in one sitting, and I thought it read much better that way than week by week. There were definitely weeks where the progress was so incremental I almost regretted buying the book. This was especially obvious when Batman was chasing dead leads. These three issues will all be about the Riddler as a potential suspect...oh, he wasn't the man behind the curtain...sorry you wasted three weeks following us there. But, in the end of the day, Batman Eternal is still a great comic and I am willing to ignore those bumps in the road. What made Batman Eternal stand out for me is how well everything came together in the end. In this week's Open Mike Night, we talked a lot about how hard it is to bring a long running mystery to a satisfying ending. Batman Eternal not only walked that line well. In issue 50 and 51, we found out that almost all of the craziness that's been impacting Gotham came from Cluemaster. 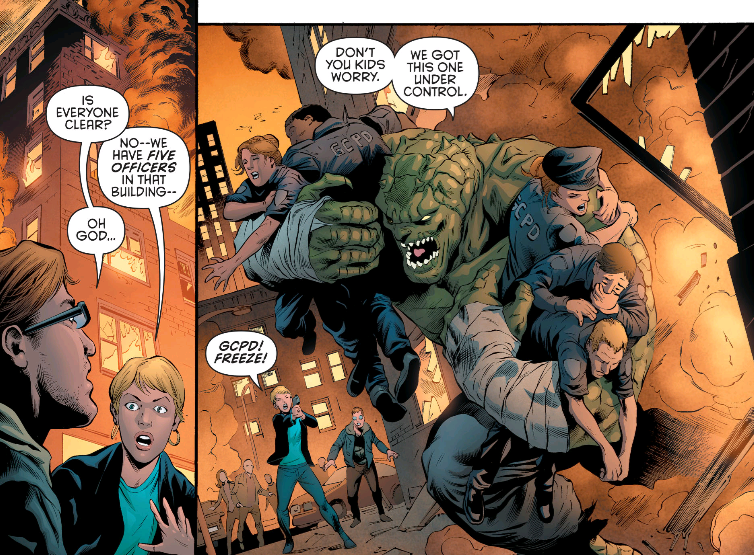 Cluemaster had the brilliant idea of riling up Gotham's most dangerous bad guys to cause trouble so that him and his gang could commit smaller crimes while the police and Batfamily were all distracted by the bigger going ons. I have said before that I like when smaller villains get elevated, and Batman Eternal definitely made me think of Cluemaster in a new way. In this issue, we also found out that Lincoln March (Owlman) was working with Cluemaster on this. 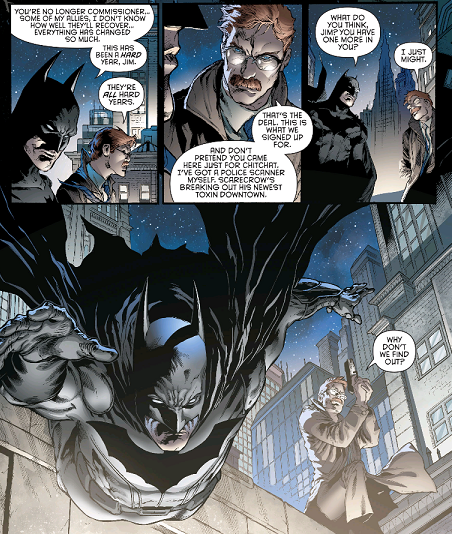 Lincoln had a much more personal agenda taking out Batman, who he claims is his brother. 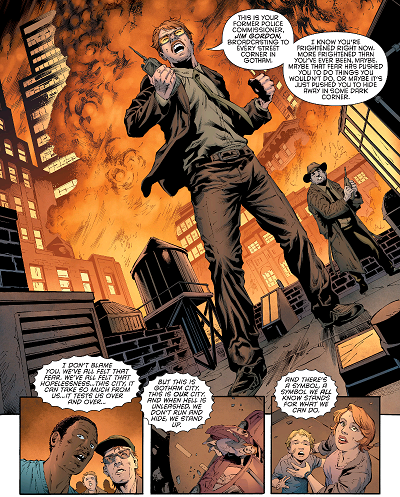 In the end, Lincoln almost gets away, but the Court of Owls quickly gets justice for their city. Actually, the theme for this issue was "enemies banding together to save Gotham once and for all." The whole city ends up coming together in a "we are Batman" moment. And it ends up working really well. It didn't feel forced or corny. After everything Gotham has been through, it just made perfect sense to end the story that way. I was really surprised and pleased by how well everything comes together in the end. The ending never felt rushed, each piece is put together carefully and makes sense in terms of the bigger stories that were told for the last year. Gotham is left with a new status quo that should set up some great stories for the future. Batman has a few new allies (like Alfred's daughter, Bluebird, and Spoiler). Batwing seems like he will be working with "Gotham by Midnight" as a supernatural specialist. Catwoman is the new crime boss in Gotham. And Gotham itself has realized that they need to stand united. Another thing that surprised me about this book is how consistent the art was. When you see a comics with 5 artists and 4 colorists listed, it is typically chaotic. I understand the need for multiple artists and colorists when you are doing a weekly book, but it still can end up as a mess. But once again, strong editorial hands seemed to be at work here. It would have been very easy to believe that only one or two artists and colorists worked on this issue. It was just that consistently great. DC seems to love doing these weekly titles, and they are often a mixed bag. I thought World's End and Future's End were okay, though those books tended to wander around quite a bit, and the endings weren't all that satisfying. Batman Eternal was probably a little too long, but it was a great book with a perfect ending. The new status quo definitely interests me. Art is great and consistent, which can't be easy when you have 5 artists and 4 colorists.